One of the most touching elements of working at Painting with a Twist is the sense of creative community that surrounds you as a part of this organization. Within our system, we certainly feel it. Our franchisees, artists, and corporate employees are an extension of our family. The feeling of a creative community just the nature of our fabric… it’s truly who we are. Many times this hits our customers – HARD. One such customer, Jodi sent us an email at the beginning of January that sang through the bustle of planning for 2017. You see, her son, Zachary has autism. Therefore, not only does he have a service animal, but he has particular needs. 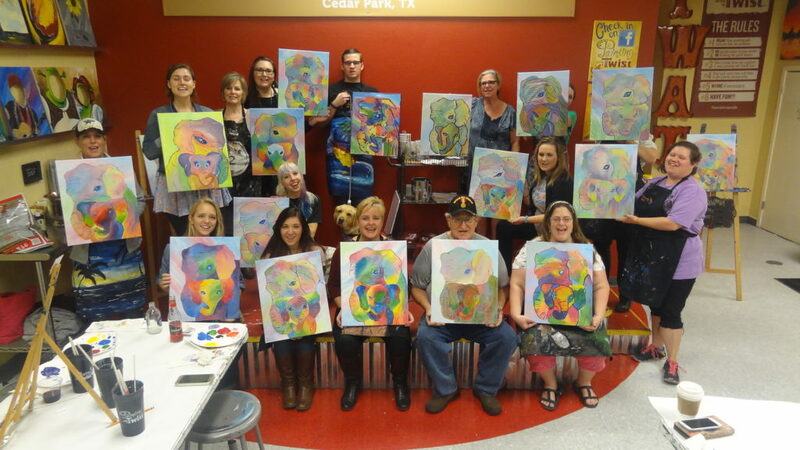 Jodi was struggling to find an outlet for Zachary when she found the creative community at Painting with a Twist in Cedar Park, TX. 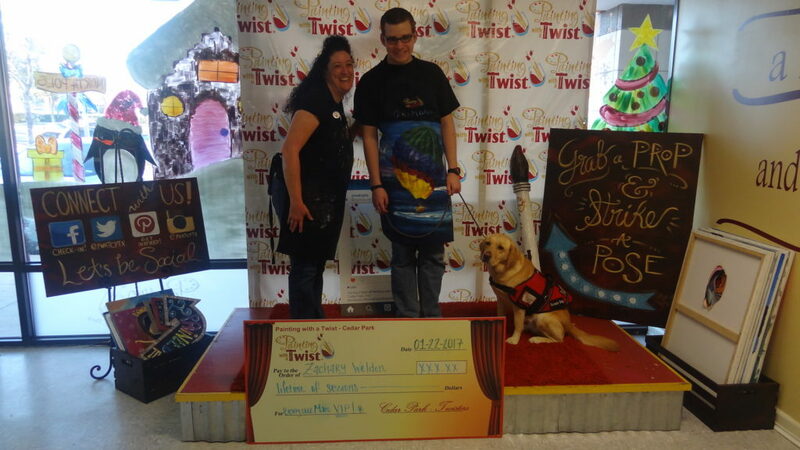 The studio owner, Sylvia and her staff welcomed Zachary and his service dog back in November 2014. Quickly they began to encourage Jodi to leave Zachary with them. He’s been painting with their creative community now [many times a week] for over two years and practically runs the show during class. Zachary’s favorite painting is the hot air balloon. He liked it so much, instructor, Ginger painted him his own apron with that picture and his name on it. Really, it seems instructors have made the biggest impact. They have brought him into the fold of the community and met Zachary where HE needs them. It’s incredibly warming to hear the creative spirit Painting with a Twist was built on continues to spread nationwide. We adore our customers and franchisees. Zachary’s story is exactly what we are trying to build – from coast to coast. *Thank you for sharing your story, Jodi. **Sylvia, you and your staff continue to bless our entire system just by being part of it. If you would like to read through Jodi’s entire email, it is below. I just wanted to take the time to tell you how wonderful one of your franchise locations is doing. Sylvia is the owner of the Cedar Park (Austin), Texas location. She and her staff have been so great with my son who has autism. Let me back up and start at the beginning. In November of 2014, we were looking for something that my son could do during the break. After calling places and being turned down because of the autism and having a service dog, many places flat out told us no that he couldn’t come in. They were concerned that things would be too hectic for him or that he and his dog would be too much of a distraction to others. I happened to call the Cedar Park PWAT just because of its location. After speaking with Sylvia she said it was no problem for him to come and his dog was definitely welcome. Summer of 2015, found us once again looking for something for him to do that also wouldn’t break the bank and would permit him to attend with younger kids because he was 17. Sylvia came to the rescue again! He attended summer camp for one week and a day or two each week throughout the summer. When Zachary first started attending, we had to stay with him for a little bit. By the time he started for the second week, he didn’t even want us going to the door. Sylvia gave us multiple discounts from giving us a free session to giving him gift certificates. Without her doing this, there was no way that he would have been able to paint so much that summer. 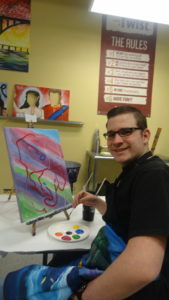 When camp ended, Zachary had such a great time that he wanted to keep painting. He now paints twice a month, sometimes more. Sylvia even let him paint in the evenings without us before he turned 18 because he and his dog weren’t a problem. There was a painting that had a hot air balloon that he wanted to paint. That class was canceled and rescheduled multiple times. Finally, they put it on the schedule and said that even if Zachary was the only one they would still do it. We had our money returned to us for the cancellations, we were given a gift certificate because of how upset Zachary kept getting and he was able to paint it for free when the class was finally held. Zachary liked the hot air balloon painting so much that the one instructor (Ginger) painted him his own apron with that picture and his name on it. Sylvia and her staff also understand how a routine is necessary for my son. Each time he paints, they have his usual spot for him ready: near the tv in the large room or on the end by the instructor when in the small room. They also know how important it is to stay on schedule and not go over the allotted time. He will tell them when the break is over or when they have five minutes left in class. Each instructor is so understanding of him and his needs. They don’t mind that he has to show up more than 15 minutes early and walk around all the studios. They know that this is just how Zachary is and are okay with it. Finally, there are the instructors themselves. Each of them had put me at ease and made me feel comfortable leaving him when he first started going there. They are all very encouraging of Zachary’s painting attempts and like the dimension, he adds to his paintings (to me, it’s just paint applied too thickly). While he likes all of the instructors that he has painted with, Ginger is by far his favorite. There are times he might find a painting he likes but won’t sign up for it because she isn’t the one teaching it. All I can say is that as a parent of a child with autism, it’s great that Sylvia and her staff so willingly invited my son into their studio without giving it a second thought when so many other places turned him away. I have friends who also have children with autism or Down syndrome and they have also said that the experience their child has received is exceptional.